The Netzach Yisrael beis medrash on Mesilat Yosef Street in Kiryat Sefer looks like any other shul dotting the city’s Torah landscape, but it contains one of the best-kept public secrets of this staunchly Litvish town: The 120 avreichim who comprise the kehillah are actually closet chassidim. They still maintain their Litvish dress and haven’t switched their children into chassidic schools, but these graduates of Ponevezh, Tifrach, and Brisk have become students of Kabbalah and Chabad and Breslov — piling into cars in the middle of the night for an hour-long hisbodedus in the nearby forest and spending Rosh Hashanah in Uman. “Over the years, we discovered each other through our individual journeys, and eventually we decided to create this kehillah,” says Reb Shlomo, one of the shul’s founders. Reb Shlomo was an avreich in Tifrach when a spiritual search took him to Rav Shimshon Pincus and Rav Moshe Shapira, then to the study of Chabad chassidus and finally, about ten years ago, to Breslov. 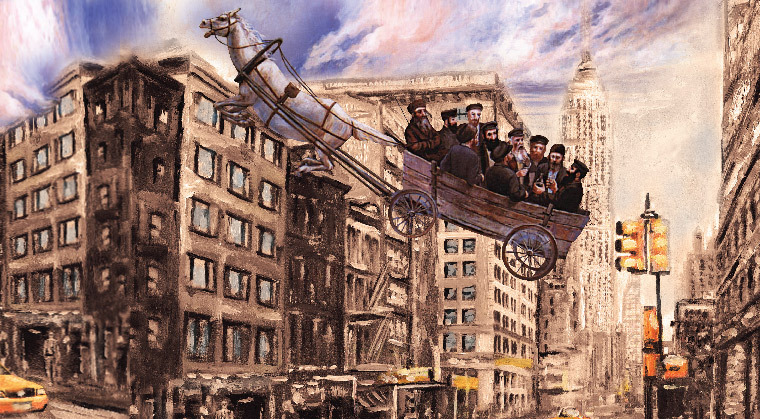 The shul, under the guidance of Jerusalem-based spiritual leader Rav Itche Meir Morgenstern, has become a chassidic destination for the general public, where people off the street — both curious onlookers and those seeking an added dimension to their Yiddishkeit — can avail themselves of chassidic seforim and an assortment of shiurim. Reb Shlomo says that he’s turned down numerous requests to be interviewed by the Israeli media, partly because he doesn’t want to call attention to the wives of the avreichim, each of whom has had to navigate dealing with her husband’s newfound identity and passion. Maybe that’s one reason Netzach Yisrael has lots of company, as part of a mushrooming trend that’s hit every facet of the Orthodox Jewish world. Walk into any “modern” beis medrash and you’ll see the tables piled up with Tanyas and Sfas Emes, as post-modern 2018 rediscovers the Mezhibuzh of 1750. From Israeli Hesder yeshivos to New York’s Yeshiva University, from Modern Orthodox Young Israel congregations to Litvish study halls in Bnei Brak and Kiryat Sefer, it seems like everyone today is looking for the Baal Shem Tov.